Good data management practices can help your research be more efficient with resources and help you make a bigger impact in your field. This session will focus on the why and the how of data management best practices and highlight UC resources. Find out how UC Libraries can help you get a handle on your data management issues. The UCBA Library hours for Fall Reading Days will be 8:00 am to 6:00 pm on Monday, October 9th and Tuesday, October 10th. The library will resume regular hours on Wednesday, October 11th. A full list of library hours can be found on the UCBA Library Hours webpage. The UCBA Library team welcomes Elizabeth Sullivan as the new Library Operations Manager. Elizabeth brings over 5 years of experience from the Public Library of Cincinnati and Hamilton County including her role as a branch manager. She also comes directly to us from the Cincinnati Zoo and Botanical Garden where she was the Manager of Member Experience and Fun (yes, she met Fiona!). Elizabeth will be managing the daily operations of the library to ensure high quality service and support for faculty, staff and students. We’re so excited to welcome Elizabeth to the UCBA Library Team! May is Asian Pacific American Heritage Month – a celebration of Asians and Pacific Islanders in the United States. The New Titles at Your UCBA Library online guide lists newly acquired books and media by subject. Select titles are highlighted on the homepage along with the ability to search for other titles in the UC Libraries system. Many of the new titles can also be found on the new book cart located next to the front desk in the library. Black History Month and the National African American Read-In book display. Stop by the UCBA Library to browse and borrow books in honor of Black History Month and the National African American Read-In (NAARI). Titles that include a yellow NAARI bookmark are written by African Americans and can be read for the NAARI event scheduled for Tuesday, February 28 at 12:00 pm in the Muntz 119 Lobby. To see a full list of titles on display, visit the National African American Read-In guide at https://guides.libraries.uc.edu/ucba-naari. It’s National Library Week and the UCBA Library is celebrating! This year we are highlighting the ways libraries transform their communities. Check out our #librariestransform video to see some amazing UCBA faculty, staff, and students share their UCBA Library stories. Come into the library and celebrate this Thursday and Friday with Crayons and Candy. Relax a little with coloring therapy while enjoying an everlasting (and transforming) gobstopper. Want to capture your relaxation? Take a selfie in our #librariestransform selfie frame, or just stop by to check our new #librariestransform signs and celebrity READ posters. We are proud and honored to be part of the UC Blue Ash community and look forward to celebrating with you this week! 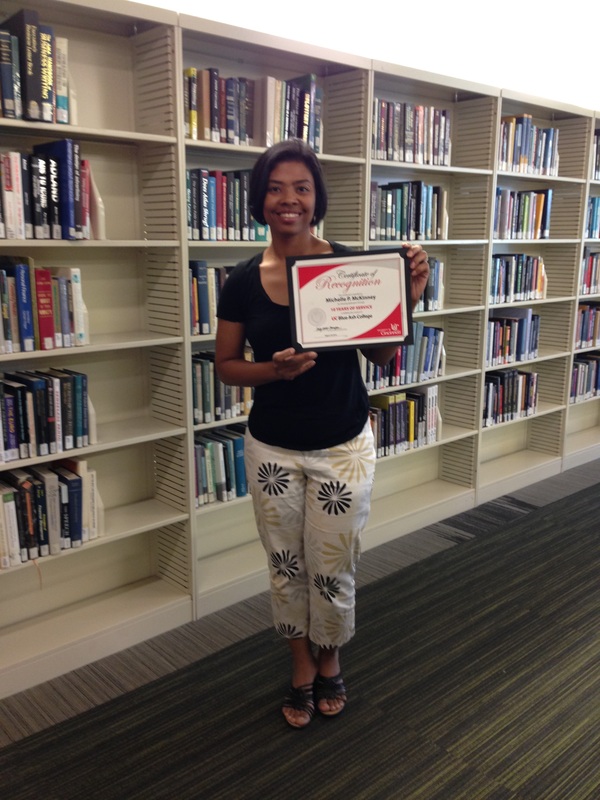 Reference and Web Services Librarian, Michelle McKinney celebrates 10 years of service at UC Blue Ash Library. Looking forward to many more! Question: Do you have a bad book habit? Heather Maloney, Library Director: Getting too many and letting them pile up on my bedside table. I try to answer all of life’s quandaries with a different book. Kellie Tilton, Instructional Technologies Librarian: Using the dust jacket flaps as a bookmark. Not as bad as earmarking the page, but still not as good as an actual bookmark. Lauren Wahman, Instruction Librarian: Finding too many good ones and running out of time to read them all. And, occasionally, picking up one that I’ve already read! Rachel Lewis, Technical Services Manager: Not at all! Tammy Manger, Public Services Manager: Falling asleep only after two pages…I hate that! Chris Marshall, Public Services Assistant: Earmarking the pages. Bad Habit!